The ability to hide an arbitrary object with a cloak at a distance from the object is a unique task in photonics research, although the phenomenon is yet to be realized in practice. In a recent study now published in Light: Science & Applications, Tianhang Chen and co-workers at the Key laboratory of Micro-Nano Electronics and Smart Systems, and the State Key Laboratory of Modern Optical Instrumentation in China proposed the first experimental realization of a remote cloaking device. The device can make any object located at a specific distance invisible using a direct current (DC) frequency. They included a negative resistor network with active elements to achieve remote function of the DC cloak. Based on the network, Chen et al. were able to remotely generate a hidden region using the cloak, without distorting currents far from the cloaked region, so that the object could continue to interact with its environment. The work showed that any object in the hidden region was invisible to a DC detector and the cloak did not require prior knowledge of the object allowing it to hide an arbitrary object. The scientists showed the superiority of the remote cloaking device for potential future applications in medical or geologic research. Transformation optics can be used to engineer a cloak that guides electromagnetic waves to bypass the cloaked region without any disturbance. Previous research on cloaks and illusion devices involved enclosing the device, preventing its interaction with the external environment, as well. 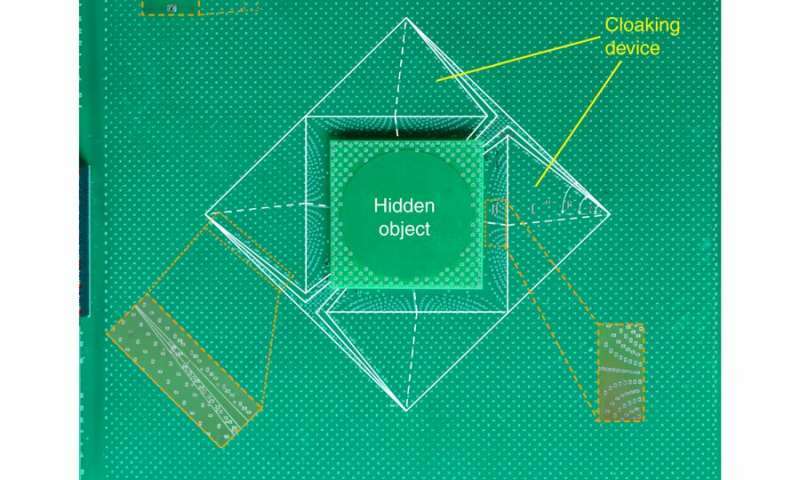 To solve this problem, scientists proposed a remote cloak that could hide an object from a distance, based on the concept of an 'anti-object,' where scattering of the hidden object was cancelled by the 'anti-object.' The results were obtained at a distance, while the hidden object kept space continuity with the background environment. However, this 'anti-object' cloak was only designed for a hidden object with known dimensions or parameters, therefore, small changes in object size, shape and its position deteriorated the exact restoration of the incident field. The 'anti-object' cannot therefore hide arbitrary objects as a conventional cloak can. 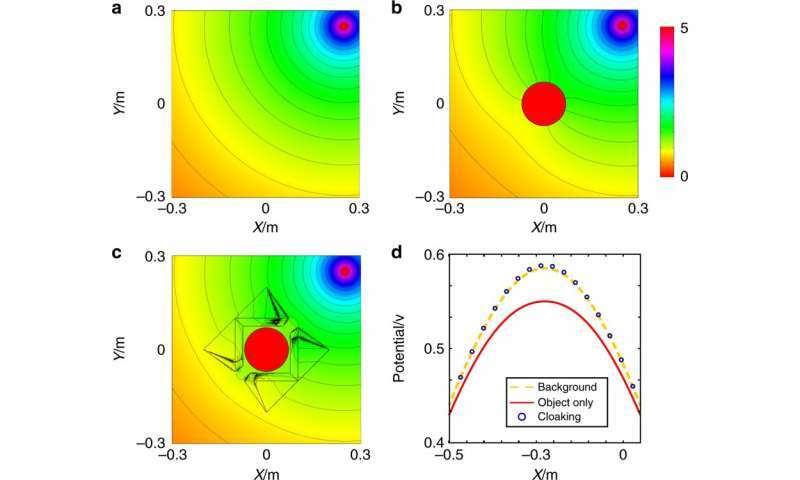 To overcome this limitation, scientists previously proposed a multifold transformation optics method to design remote cloaking to hide objects of arbitrary shapes. Yet, such designs required double-negative materials that are very difficult to realize. As a result, remotely hiding arbitrary objects is still at a conceptual stage and remains to be experimentally demonstrated. In the present study, Chen et al. 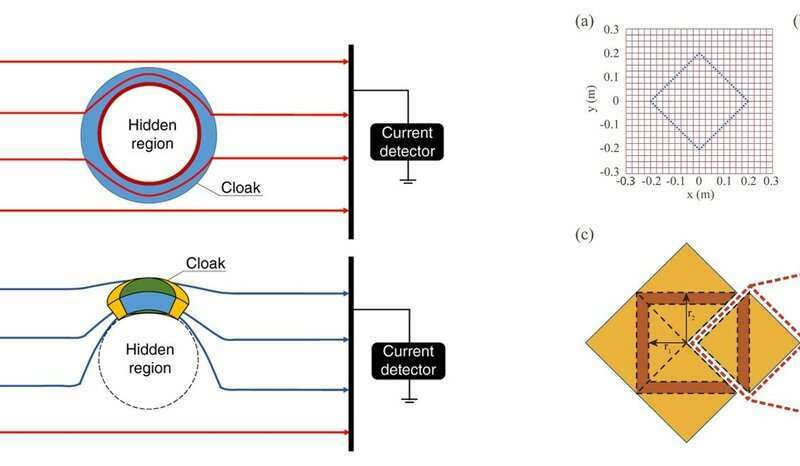 proposed the first experimental realization of a remote cloaking device to hide an arbitrary object with a cloak using direct current frequency. They designed the remote DC cloaking device with multi-folded transformation optics and realized a negative resistor network with active elements to play an important role to implement remote function of the DC cloak. The cloak could remotely generate a hidden region without distorting the current. The scientists showed how different objects in the hidden region were invisible. In the experimental setup, Chen et al. compared two kinds of cloaking; including a closed, conventional cloak and remote cloaking at DC frequency. A remote cloak could be constructed with one element or with several elements, and the study used two elements as an example. The scientists first transformed the free space into a square cloak, followed by a second transformation to fold the square cloak to open it. The hidden region in the present work still retained space continuity with the background environment, while completely insulated from outside current fields, enabling any arbitrary static object in the hidden region to freely move inside the region while remaining invisible. The phenomenon reported by Chen et al. differed completely from previous DC cloaks, where the cloak performance depended on the shape and conductivity of the hidden object. The scientists performed simulations of the cloak with the finite element method analysis using COMSOL Multiphysics software. The simulated current flowed from the point source through the cloak. Chen et al. used a steady current-source at the top right corner of the simulation and simulated the potential distribution where current flowed from a point source in three different scenarios. To verify the object-independent performance of the cloak, Chen et al. tested two additional hidden objects; a square insulator and a circular conductor. They measured the electric potential compared with the cases of the background and object alone, for excellent agreement between the two; indicating that the cloaking performance was independent of the size and shape of the object. Left: Schematic of the effective negative media (resistor). a) Ideal negative resistor. b) Equivalent negative resistor by applying the impedance match module. c) Simplified two-source module. 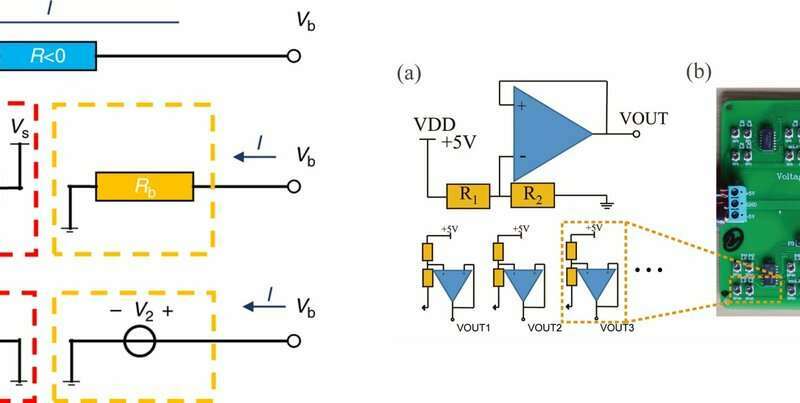 Right: The circuit design of negative media at direct current frequency. (a) The schematic of the voltage-follower based bleeder circuit array. (b) The fabricated PCB (printed circuit board) sub circuit with 31 legs of equivalent negative resistors. Credit: Light: Science & Applications, doi: 10.1038/s41377-019-0141-2. To demonstrate the omnidirectional effect of the remote cloak, Chen et al simulated the steady current-source in a different position relative to the cloak, and the cloaking device still worked as expected. However, they showed that when the distance between the cloak and the object increased, the cloak involved more negative parameters. Accordingly, the computational complexity and memory consumption also increased in the simulation. In total, the simulations generated in the study provided an example to verify the concept of the remote cloak. To experimentally demonstrate the concept, Chen et al. designed and fabricated the remote cloak sample. The cloak required anisotropic and negative conductivity to realize the complex media. The scientists used "mesh-based" transformation optics to design anisotropic conductivity, while using a negative medium with active elements to design negative conductivity. They observed that the DC negative conductivity material provided potential 'rise' when the current traversed the material. At DC frequency, the resistor and source could be combined and simplified to a single source with a power supply. To practically realize such effective negative media, the scientists provided the required electric potential with a voltage follower. To practically implement the experiments, they applied four circuit boards to fulfill the negative resistors. a) Experiment set-up. b–d) The measured potential distributions in experiments when currents flow from a point source through the remote cloak with three different objects: b circular insulator, c) circular conductor (perfect electrical conductor, PEC), and d) square insulator. e) The measured electric potential on the line y = x(m) compared with a no-object background. The circle, triangle, and square dashed lines are for the three cloaking cases, respectively. Credit: Light: Science & Applications, doi: 10.1038/s41377-019-0141-2. To verify the device performance, the scientists fabricated the whole circuit board at a size of 60 x 60 cm and achieved the required electric conductivity with surface mounted device (SMD) resistors. They then designed the negative media, cloaked object and boundary matching with independent circuit boards separated from the main board for ease of replacement. The scientists measured the results for three different hidden objects, including a circular conductor and square insulator. In the results, the equipotential lines appeared "round" as if nothing was there, to indicate the experimental design worked appropriately in practice. The outcome was possible since the experimental setup cancelled the distortion caused by the different hidden objects to indicate good cloaking functionality. The outcome was further strengthened when Chen et al. analyzed the electric potential decay from the source for the three experiments, where the results agreed well with the no-object background. The performance of the proposed remote cloak was independent of the object. In this way, Chen et al. experimentally demonstrated a remote cloak that worked for arbitrary objects at a distance using DC frequency for the first time. Since the electronic components they used were DC static elements, the cloak was much more stable than those engineered with high frequencies. Most importantly, the cloak was able to guide electric currents around a hidden object with the help of active elements as the object maintained physical connection to its environment. For instance, such arbitrary objects can be buried underground with a cloaking device deployed on the object at a distance for its invisibility under geologic current sensors for applications in geologic research. In addition, the cloak can have potential applications in medicine to prevent interference to devices implanted in vivo.